My oldest son doesn’t have many chores although if you ask him he’d say he has way too many and that I am WAY too picky about how they should be done. I know if I want it done right I should do it myself OR I could stand over him after he “says” he’s done and point out everything he missed. It’s a pain but it will sink in that hard head one day (I hope!). Two of his chores are making sure the cats are fed and cleaning the litter box. In our house, the “cat room” is the closet underneath the stairs. In there they have their food and litter box and can come and go as they please thanks to the cat hole in the door. It gives them a safe place to go while helping my house not smell like a huge litter box. This is saying something considering one of my cats think she’s too good to cover her poo. That’s right she will do her business and instead of covering it she will scratch the walls of the litter box and be on her way. All I can do is shake my head and be like “Really?!?”. She’s lucky she’s pretty! Anyway, somehow despite everything being in one room my son often overlooks the cat food somehow. 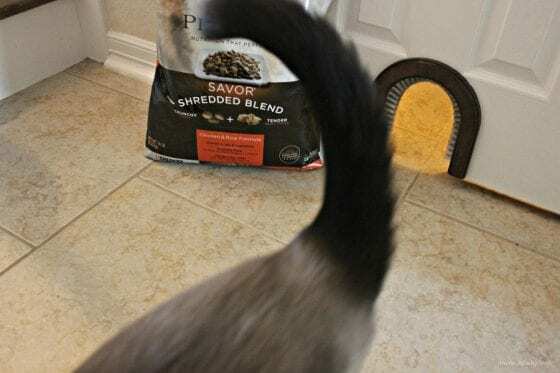 The room is stocked with Purina® Pro Plan® Savor Shredded Blend that I picked up at PetSmart in the cat section yet he finds some excuse as to why he didn’t notice the cats morphing into hangry little beasts. When he does forget boy are we in for it. 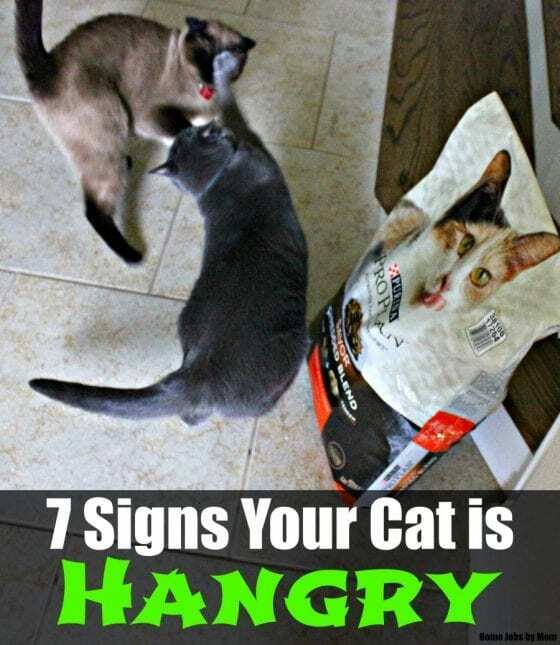 Here are 7 ways we know our cats are hangry (at him!). 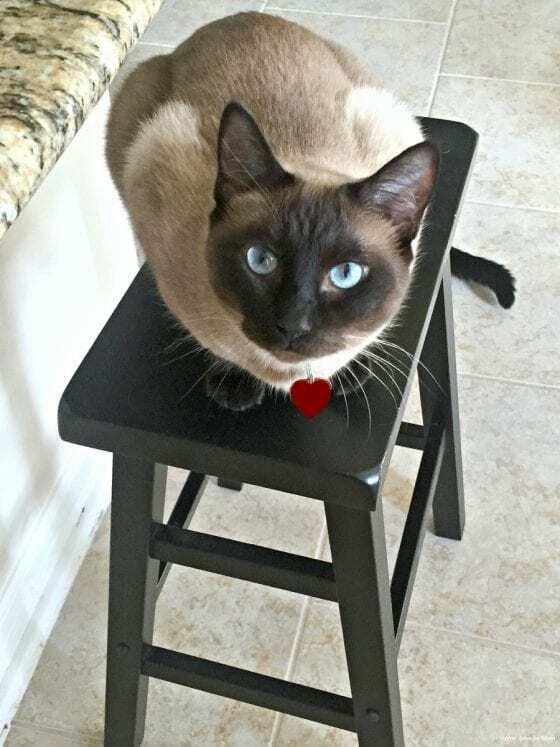 Meet Pepper, our three-year-old Siamese cat that we swear is more like a dog than a cat. Yep, you guessed it… she’s the none poo cover-er. Told you she’s like a dog. When Pepper is hangry her dog like qualities come out even more. She will literally beg on her back paws like a dog especially if you reach out a hand. If she’s desperate enough she will find the cat food and bite a hole into the bag or knock over the storage container. Rowdy girl! Pepper is the only cat we’ve ever had that will actually knock on a door instead of just meowing at it. If she’s hangry enough she will hunt you down even when you are the in the shower. There she will constantly bang at the shower door with her paws until you come out and give her what she wants. When Pepper wants something you know it just by how she stares at you. She gives this death stare with her brilliant blues and where ever you move so do her eyes. Lilo is our old girl. She is 12 years old and is the queen of the cats and she makes sure the others know it. When Lilo is hangry she gets EXTRA whiney. In her old age she meows a lot more than she used to but when she’s out of food she performs a rendition of the Meow Mix commercial. Meow, meow, meow, meow is all you will hear until her bowl is full. Too bad it doesn’t come with the paycheck that cat gets, but at least there are other ways to save money on pet food. Then there’s Bella. 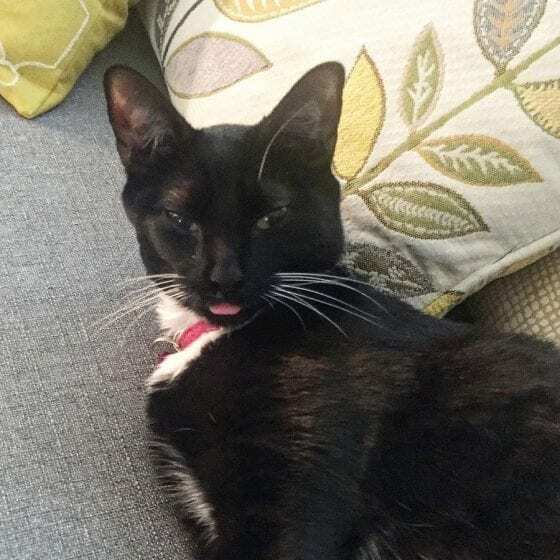 She just turned a year old and is our most skittish cat yet she likes to make faces! I will be in a dead sleep and oh so comfy until a wet little nose gets jabbed into my eye. I try to turn and ignore the nightmare but then my hand keeps getting flung up and down by a head trying to go underneath it. Bella will practically make me hit myself in the face until I follow her to the food bowl. I want to keep my cats safe so I feed them ASAP so they don’t eat something they shouldn’t. Other times, it’s like the cats have had enough. They swarm at your feet, circling them like prey, secretly hoping we’ll fall down the stairs. I know I am in real trouble when I have all three cats following me around the house. It’s like I am the mama duck and they are my chicks. 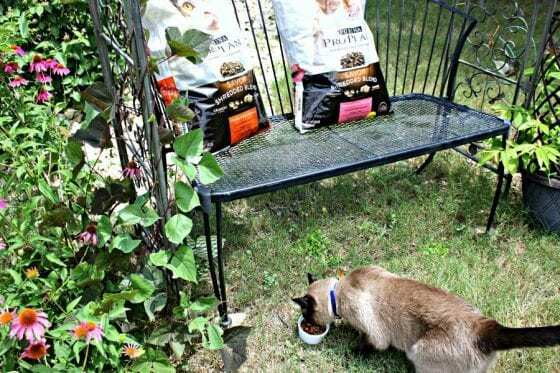 When it gets down to this moment I have no choice but to grab bags of Purina® Pro Plan® Savor® and do my son’s chore for him. While I hate letting him off the hook doing this allows me to connect with my sweet girls. After all, if it wasn’t for them I’d be the only female in this house. So we have to stick together and mealtime is the perfect time to do this. I secretly savor every moment with them, especially mealtime. Shh, don’t tell my son but little does he know animals and food go hand and hand. He who has the food has their love. When they are at their hangriest I’ve noticed feeding them a combination of wet and dry food makes them the happiness. 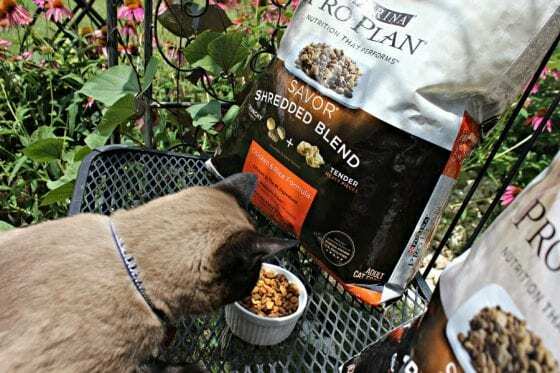 Now thanks to Purina® Pro Plan® Savor Shredded Blend I can give them the best of both worlds in one swoop – crunchy kibble and tender shredded meaty pieces! This sensory experience gives them the nutrition they deserve (real meat, high protein, vitamins and minerals, antioxidants) in flavors that they are happily glad to scarf down. 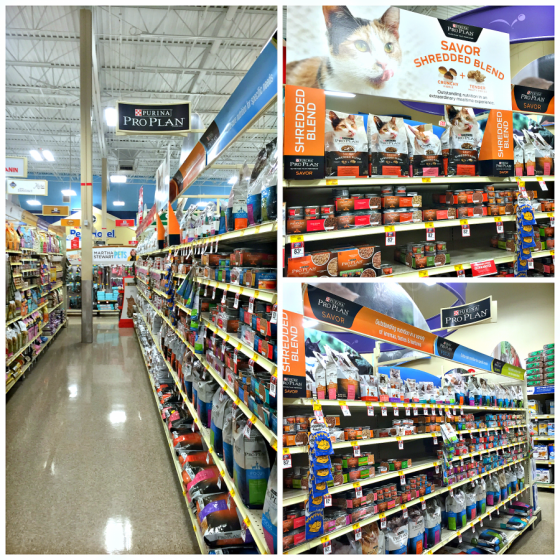 I love that Purina® Pro Plan® Savor® doesn’t contain any unnecessary ingredients. It gives me one less thing to worry about this summer now that the kids are out of school. Instead of worrying about what my girls are eating, I can savor every second spent with my family (my girls included!). What crazy things do your cats do when they are hungry? Ha ha. I wasn’t at all a cat person until I met Marley. 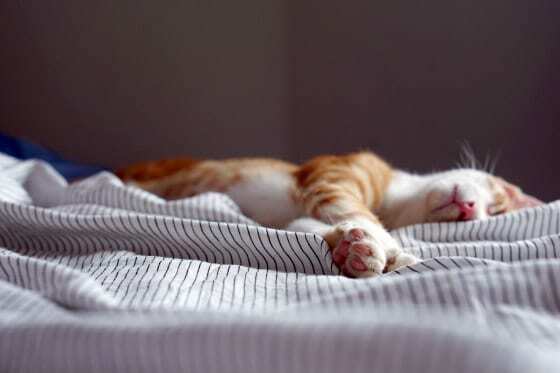 A ginger female kitten. My son has been wanting one for years and when he did really well at his final exams at 16, I gave in! Marley is now ten months old and sad to say, my son doesn’t do a good job of caring for her so if I don’t take up the job, she gets HANGRY too often and I’m sorry for her! As a result I’ve been threatening to put Marley up for adoption! I know it breaks my heart too. But I want my son to get the point that if this was his real daughter, she’d be taken in to foster care! Haven’t found her a home yet, but hopefully soon. Thanks for your article. I’m in Birmingham, England btw if anyone wants a cute, friendly little frisker! http://joleisa.com/can-guest-post-us-like/ Is my latest post. I’m sorry your son isn’t taking care of his pet. I hope you are able to find her a good home! Hi Krystle, it sounds as if your cats have as much personality as mine does. They are definitely a quirky pet. Never a dull moment with my inquisitive cat. Hi Susan! Yes, my crazy all have an interesting personality. They def keep us entertained. Your cats are so pretty! And I’m pretty sure my cats are always hangry… if they can even see the bottom of their bowl they go crazy. Thank you! I totally know what you mean. There has to be at least thin layer covering the bottom or in their eyes it’s not there LOL. I don’t have cats (I have dogs now), but I grew up with cats. Sometimes one of my dogs acts like a cat because of the way he sleeps and the way he lays on stuff hahah. Your kitties are so cute! I have never had an indoor cat but these stories are hilarious!! The evil eye I think is a thing all older cats become very good at!! I couldn’t agree more! It’s like an older woman who has perfected the stank eye haha! The puppy eyes…haha! My friend’s dog will lay his head on her knee and stare at her. Too cute. My cat is unbearable when he is hungry! Wherever we are, he WILL find us and let us know he’s hungry. There’s no hiding from a cat. They’re ruthless little things. We can’t leave our dish filled or our cats would never stop eating. They have no control haha. Beautiful cats! 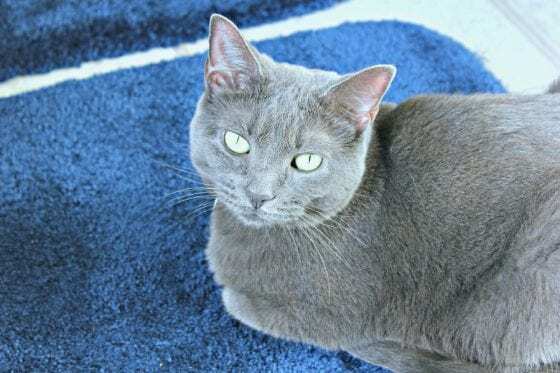 We aren’t cat people, because I’m severely allergic, but great tips if you are cat people! I have a friend who is allergic as well. However, she just has the softest heart ever and has two rescue cats that she saved and nursed back to health. This is too funny-its like a toddler. One time the cat was trying to drink out of our sink. Turns out, we forgot to fill her bowl. True story. That is hilarious. Smart little things aren’t they?! I couldn’t agree more! Purina has always been a consistent brand I could count on. What a fun post! We have two cats and one likes food very very much. The second he sees us awake in the morning he starts howling for wet food even though he has access to dry food. That is too funny. My friend has always said that cats saw us as their servants. Haha this is too funny, my cat does some funny things when he’s hangry too. He likes to be right under my feet and paw at the pantry door. Don’t you hate when they trip you up?? It’s like, listen here, I’m trying to get to your food can you not kill me before I get?! A process is the perfect way to put it haha! Each one has a different personality. Awww!!! Your cats are so cute! Our cat (Sonic) will meow non stop. Not just a regular meow but a meow from deep down in his soul. LOL!!!! hahaha! I bet that’s cute and annoying all at once. We have one that’s like that as well. I don’t have a cat so I’m not really familiar with their behaviors. However, I do have twins that are hangry quite often! Your cats are beautiful! Thank you so much! Oh goodness, twins! I bet they’re a handful more so than my cats! Well, apparently we have a cat that is perpetually hangry… or, she just isn’t a very nice cat most of the time. Which is probably the case: she’s one of those tiny, skittish, high-strung black cats, and she’s been this was since she was a kitten. And yet, we love her. All cats have their own crazy personality. However, all are crazy haha. She sounds like she’s impossible NOT to love. The evil cat eye is not fun. They know what they are doing and it can be scary! lol Cats definitely have interesting behaviors. Wow, your cats are so beautiful. The blue eyes on Pepper are amazing. I definitely have had cats with hangry tendencies, lol. Haha, I think I have one of those cats too lol.